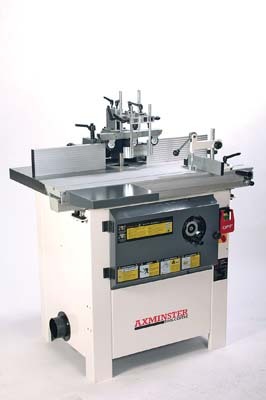 There are numerous models to choose from, but on paper the WS1000TA from Axminster seems to tick a lot of boxes for some quite serious work, while remaining within the budget of a semi pro workshop. Time to take it for a spin! The first thing you notice about the WS1000TA is the build quality. At this sort of level you would normally expect a relatively light fabrication, but this machine is made from 4mm sheet steel with a large cast iron top so it weighs in at 218kg. The cast section of the table is a very useful 1,000 x 360mm, but a neat sliding table runs alongside giving you an additional 250mm of support. In addition there is a further small sheet steel extension that can be positioned anywhere along the side of the sliding table. The sliding section was not very well aligned with the cast table on the test machine and there is a rather fiddly adjustment facility for the slide under the support arm, but I found it easier to adjust the cast table instead. 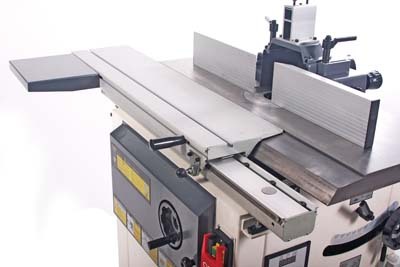 The table opening is 190mm so you can use some pretty hefty tooling and as you would expect there are a series of close fitting rings which allow you to close the opening down to suit the tooling being used at the time. 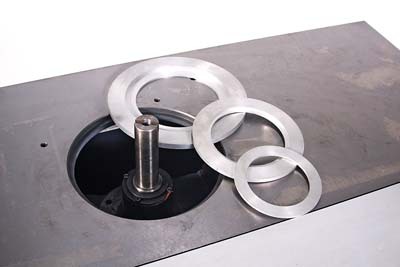 The maximum recommended diameter tooling below the table is 180mm and 200mm above. 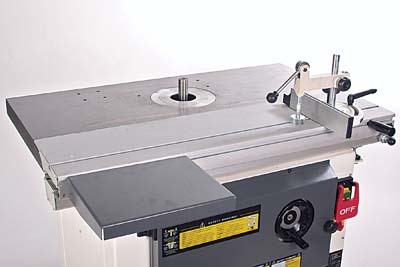 Surprisingly for a moulder in this price range, there is a tilting spindle. For me this is a real asset and opens up a whole new world of profiles using standard tooling. The tilt range is +5° to -45° so there are plenty of possibilities for chamfering as well. 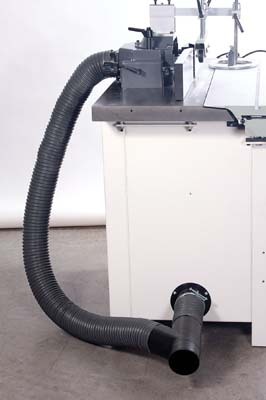 The fences are mounted on a large cast alloy hood with integral dust extraction port. This hood locks onto the table with two horrible Bristol type handles that require constant downward pressure to engage, which makes them awkward to adjust. This is a shame because the rest of the fence assembly is good, although the sliding parts for the face wings did need a little fettling to make them slide more easily. This is a problem you often come across on cheaper machines like this, in that you need to spend an hour or so filing off sharp edges and generally tuning the adjustments. However, once done it all works well and in reality you have to remember just how much you are getting for your money. A few minor niggles are soon overcome and in the whole scheme of things you shouldn't really grumble. Another plus is that both the fences are independently adjustable in-and-out via two large knobs on the back. Usually only one is moveable, but having two makes it so much easier to make fine adjustments to the profile. I was not so keen on the hold-down mechanism. It looks like a real afterthought and seems unnecessarily complicated, with no less than eight separate locking handles to adjust and some very sharp corners on the supporting arms. Having said that though, once you do finally get it set up, the spring loaded roller guides are very effective. 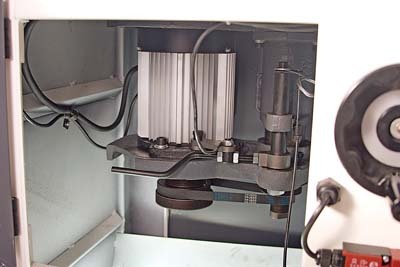 The side pressure spring is too rigid to be of much use - it is more of a guard - but the top rollers are enough to keep the work in place anyway. 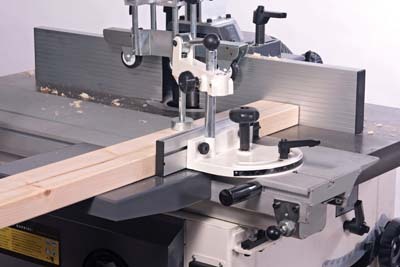 The sliding table works well for tenoning type work but is very easily locked in position for conventional cuts. 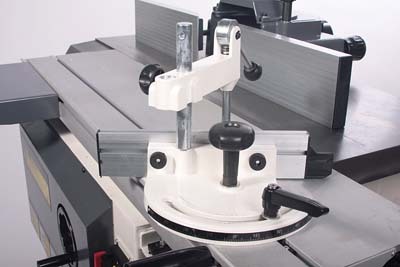 A large adjustable angle guide can be located anywhere along the sliding table and a cam lever provides instant, firm clamping for the work. I was surprised that there was no means of locking the guide square, instead you have to rely on a rather vague scale. 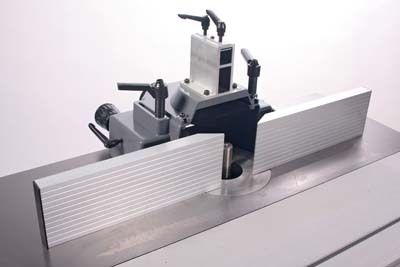 However, used in conjunction with the mini extension table, the angle guide and the sliding table ensures you have the perfect set up for tenoning or panel work. The controls are as you would expect, with a handwheel on the side of the machine for the tilt. This is one of those with the fold-in handle which is great for clumsy people like me who are always dropping planks off the bed of the machine and destroying anything sticking out. 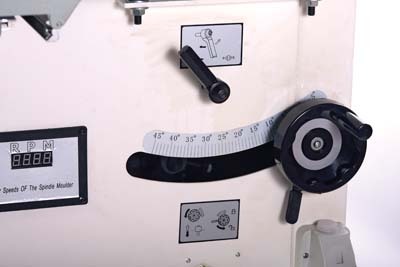 The scale for the tilt is on the front, but again, unless I have missed something, there is no positive lock to ensure the spindle is back vertical. You will have to use a square off the table to get it spot on. The rise and fall handwheel is on the front. This is geared very low so it takes forever winding it up and down if you want to make quick adjustments to the height but you have 100mm of travel available. The advantage is that fine adjustments are then very much easier, which is probably better unless, like me, you have a very impatient nature! The lock for the rise and fall is a very flimsy affair, being little more than a piece of thin, bent metal. But it seemed to be effective enough in use. 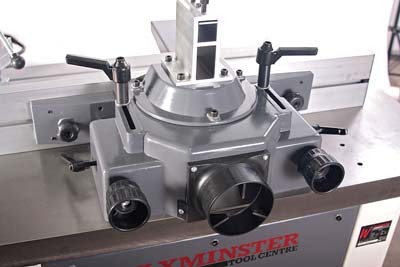 The WS1000TA is a four-speed machine, with speeds of 9,000, 6,000, 3,000, and 1,800rpm, so you can use a wide variety of tooling or even sanding drums. 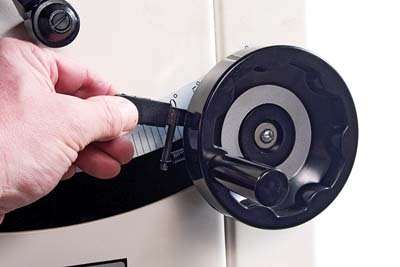 The speed is changed via a four-step pulley accessed through a side panel. This is quite a fiddly operation: you have to slacken off a couple of bolts before you can hinge the motor and slacken the drive belt, but to be fair, it is not something you need to do very often so I could probably live with it. 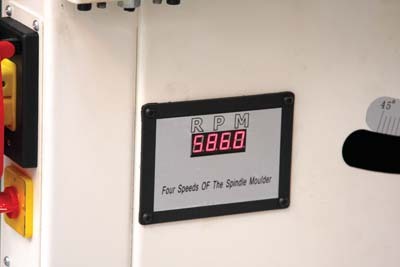 However, what is disappointing is that, although you have a digital readout of the speed, this only operates when the machine is actually running. You get a nice red display of the exact speed, but when it is stationary there is no indication of what speed is selected unless you open up the casing and physically look. So you need to be aware of this, but as most small tooling is quite safe, even run on the top speed, I think this is more of an inconvenience than a danger. Do be careful though with big diameter cutterblocks and check the maximum speeds stamped on them. 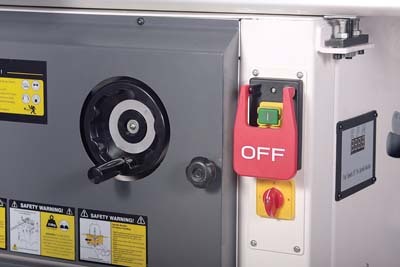 The on/off switch is very accessible and more importantly, the off switch is particularly easy to hit in a hurry. You also have a reverse switch, though this should only ever be used when you are sure you know what you are doing and usually only with a power feed. The motor is a beefy 2.8kW and as big cutterblocks generate a lot of inertia, it does require a 20amp supply to get it all started. There is also an integral brake to bring it all to a halt very quickly. 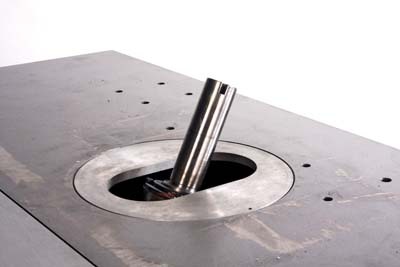 The spindle is fitted with a variety of collars for coarse adjustment of the height of the block. 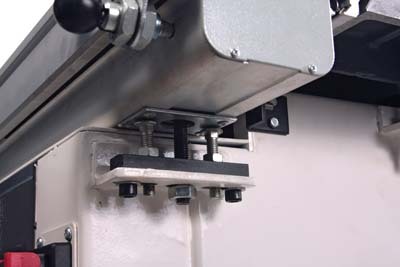 The top cap incorporates spanner flats for holding the spindle whilst you tighten up the block, there is no independent spindle lock. It seems that there have been a lot of negatives, but most of them are relatively minor and the sheer mass of the machine makes it quiet and vibration free to use; in fact it is a real pleasure. There are also some useful options available at extra cost, like the square table on a swing arm for tenoning long pieces or for panel work. 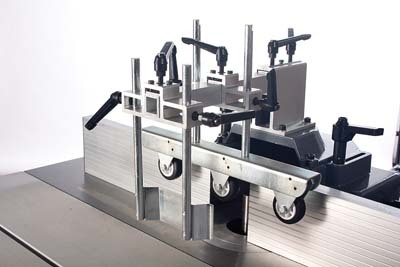 An additional tenoning plate allows you to fit and use two blocks simultaneously and a wheel base allows you to move the machine around the workshop easily if necessary. Surprisingly there is no ring fence but there are third party options for this if you are into curved work. This is a nice piece of kit at a sensible price and more than capable of light trade use. You need to be prepared to do a bit of tweaking and fettling to get it all working smoothly and also accept some minor limitations, but as mentioned previously, it still scores pretty highly in the value-for-money stakes.